Facebook is still reeling from the revelation that it hired an opposition research firm with close ties to the Republican party, but its relationship with Definers Public Affairs isn’t the company’s only recent contract work with deeply GOP-linked strategy firms. While that work alone isn’t cause for controversy, Facebook’s work with Republican groups does call into question the ongoing narrative that Facebook operates with an anti-conservative bias. According to sources familiar with the project, Facebook also contracted with Targeted Victory, described as “the GOP’s go-to technology consultant firm.” Targeted Victory worked with Facebook on the company’s Community Boost roadshow, a tour of U.S. cities meant to stimulate small business interest in Facebook as a business and ad platform. The ongoing Community Boost initiative, announced in late 2017, kicked off earlier this year with stops in cities like and Topeka, Kansas and Albuquerque, New Mexico. Facebook also worked with Targeted Victory on the company’s ad transparency efforts. Over the last year, Facebook has attempted to ward off regulation from Congress over ad disclosure, even putting forth some self-regulatory efforts to appease legislators. Specifically, it has dedicated considerable lobbying resources to slow any progress from the Honest Ads Act, a piece of legislature that would force the company to make retain copies of election ads, disclose spending and more. Targeted Victory, a digital strategy and marketing firm, is not a registered lobbyist for Facebook on any work relating to ad transparency. On his company biography page, Targeted Victory founder and CEO Zac Moffatt describes his experience helping companies “enhance their brand and get their message out in the current political and media environment,” mentioning Facebook, FedEx and Gillette as corporate clients. The bio page appears to be one of the only public mentions of his work with Facebook and the company was not mentioned alongside Gillette and FedEx on his Linkedin page. TechCrunch reached out to Facebook to ask if it also contracted with equivalent left-leaning groups or other political firms it was willing to disclose because information about the many firms a company like Facebook contracts with is generally not openly available. The company declined to comment on its political contract work and on the nature of its work with Targeted Victory. 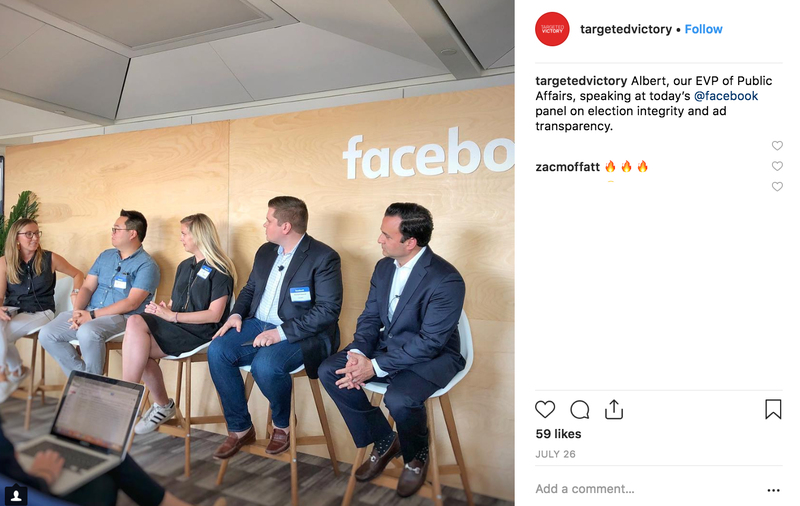 In July and September of this year, Facebook hosted members of Targeted Victory for panels on election integrity and ad transparency, as well as best practices for election season. It’s unclear if Facebook disclosed its financial relationship to the company at the time. In March of 2017, a blog post by Targeted Victory mentioned that a new investment would “strengthen [Targeted Victory’s] already unmatched relationships with top teams at Facebook, Google, Twitter and Snapchat” indicating that the company had an established rapport with Facebook and other major tech companies at the time. TechCrunch contacted Targeted Victory about the nature of its work for this story but did not receive a reply. Like Definers, Targeted Victory was founded by digital team members from Mitt Romney’s 2012 presidential campaign who formed their own companies in the election’s aftermath. As TechCrunch previously reported, Facebook’s communications team has a number of ties to Romney’s campaign. The company’s contract work with Definers arose out of those connections, particularly through Andrea Saul, Facebook’s Director of Policy Communications . Though the depth of Facebook’s work with Targeted Victory is not yet known, TechCrunch will continue to report what it learns. Prior to Targeted Victory, Moffatt served as the digital director on the Romney campaign, founding his company after the campaign dissolved. Before working on the campaign, Moffatt worked for the Republican National Committee. While the extent of Targeted Victory’s work with Facebook is not clear, Moffatt’s firm provides a range of potentially relevant services. On its website, Targeted Victory advertises “public affairs, advertising, media planning, fundraising and reputation management.” The company also offers services in online political advertising and voter targeting as dual areas of expertise. Late last year, Moffatt suggested that Facebook’s efforts to self regulate could boost the social giant’s profits. Specifically, that Facebook’s decision to ask political groups to publish the ads they buy could generate even more interest in ad buys as firms see what their rivals are up to and ratchet up their spending. The world’s largest social network might be regarded as a just another liberal Silicon Valley stronghold by critics on the right, but Facebook’s financial disclosures and contract work tell a fairly different story. Facebook’s lobbying and federal political contributions in recent years depict a company with financial heft doled out to both the left and the right. Facebook’s federal lobbyists and political donations are registered in searchable public databases, but, as with any company, that data only reveals the surface layer of political relationships. Over the last three years, Facebook’s registered lobbying expenditures were mostly spent on large, uncontroversial bipartisan firms, a few smaller groups with specific partisan ties and a smattering of other issue-specific specialists. For example, Facebook brought on a Democratic former Senate chief of staff for lobbying related to “data security, online privacy, and elections integrity” and a firm called Capitol Tax Partners to lobby around tax reform. Historically, Facebook’s donations to Democratic candidates outweigh those to Republicans, though the numbers approached parity in the 2012 and 2014 election cycles. On the other hand, Facebook’s PAC, established in 2011, favored Republican candidates in three of the last four national election cycles, tipping Democratic by a margin of 1% in 2018. In 2016 Facebook’s PAC gave 44% of contributions to Democrats and 55% to Republican candidates. At Facebook, Vice President of Global Public Policy Joel Kaplan “oversees all corporate political activity, including lobbying activities and political contributions.” A prominent Republican, Kaplan also oversees Facebook’s state level contributions, collected here, with the help of members of the company’s Public Policy, Legal and Communications departments. Kaplan made headlines in September when he sat in support of Brett Kavanaugh, the Supreme Court nominee accused of sexual violence and later confirmed. Following the confirmation, Kaplan and his wife hosted a party for Kavanaugh. It’s not clear when Facebook’s relationship with Targeted Victory began and whether Facebook has ramped up relationships with conservative consultants in recent years or held them steady. In May 2016, Moffatt attended a high profile meeting with Mark Zuckerberg, Sheryl Sandberg and 15 other prominent conservatives. Facebook ostensibly organized the meeting to mend fences with Republicans who were criticizing the social giant for a perceived bias against conservatives. In spite of the Facebook’s apparent financial ties to some of the GOP’s most closely held strategic groups, its Republican-helmed D.C. office and its contributions to candidates on both the left and right, criticisms that Facebook operates with a left-leaning bias remain a familiar chorus. Know anything about this story and have something to add? Email taylor.hatmaker@techcrunch.com. Secure contact for files and sensitive info: Signal 510.545.3125 or thatmaker@protonmail.com.